This example briefly describes the creation of a basic input file and the six required sections for utilizing MOOSE for solving a problem. We consider the steady-state diffusion equation on the 3D domain : find such that , on the bottom, on the top and with on the remaining boundaries. The weak form (see Finite Elements Principles) of this equation, in inner-product notation, is given by: , where are the test functions and is the finite element solution. In this simple problem, a single variable, 'diffused,' is defined, which represents u from the continuous problem. The 'diffused' variable is approximated with linear Lagrange shape functions. # We use a pre-generated mesh file (in exodus format). # This mesh file has 'top' and 'bottom' named boundaries defined inside it. 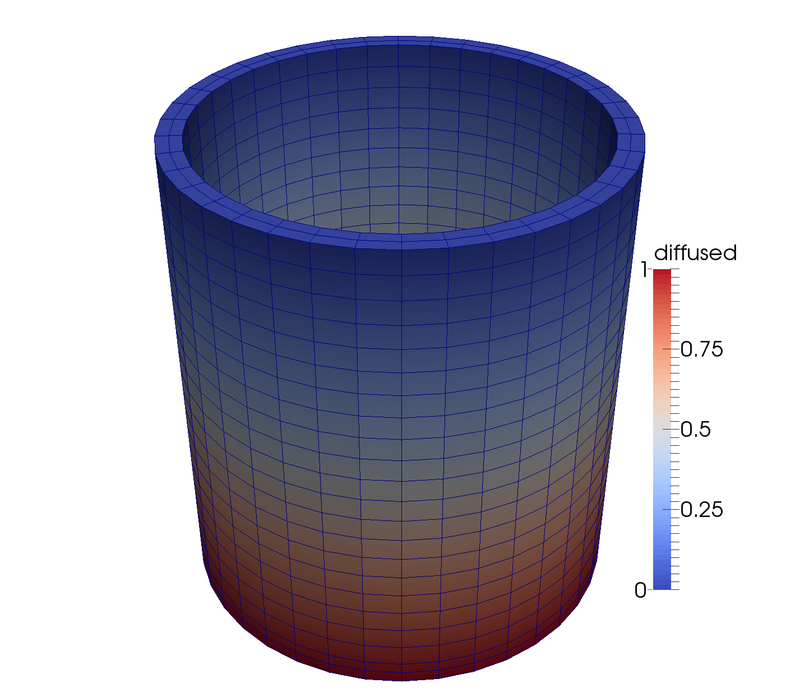 The weak form of the problem statement is represented by a Diffusion Kernel object. In general, users write custom Kernels that reside in their own MOOSE-based application(s), but in this case the Diffusion Kernel is already defined in MOOSE. To use a particular Kernel object an input file sub-section is defined, labeled "diff" (this is an arbitrary user-defined name), that utilizes the Diffusion Kernel and acts on the previously defined variable "diffused". Boundary conditions are defined in a manner similar to Kernels. For this problem two Dirichlet boundary conditions are required. In the input file the two boundary conditions are specified each using the DirichletBC object provided by MOOSE. Within each of the two sub-section, named "top" and "bottom" by the user, the boundary conditions are linked to their associated variable(s) (i.e. "diffused" in this case) and boundaries. 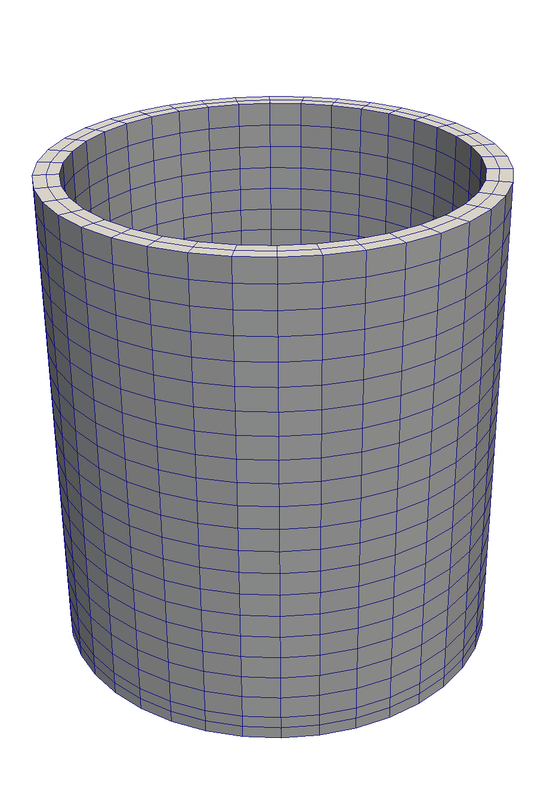 In this case, the mesh file mug.e defines labeled the boundaries "top" and "bottom" which we can refer to. Boundaries will also often be specified by number IDs - depending on how your mesh file was generated. Note, the Neumann boundary conditions for this problem (on the left and right sides) are satisfied implicitly and are not necessary for us to define. However, for non-zero Neumann or other boundary conditions many built-in objects are provided by MOOSE (e.g., NeumannBC). You can also create custom boundary conditions derived from the existing objects within MOOSE. The type of problem to solve and the method for solving it is defined within the Executioner block. This problem is steady-state and will use the Steady Executioner and will use the default solving method Preconditioned Jacobain Free Newton Krylov. Here two types of outputs are enabled: output to the screen (console) and output to an Exodus II file (exodus). Setting the "file_base" parameter is optional, in this example it forces the output file to be named "out.e" ("e" is the extension used for the Exodus II format). This will generate the results file, out.e, as shown in Figure 1. This file may be viewed using Peacock or an external application that supports the Exodus II format (e.g., Paraview).